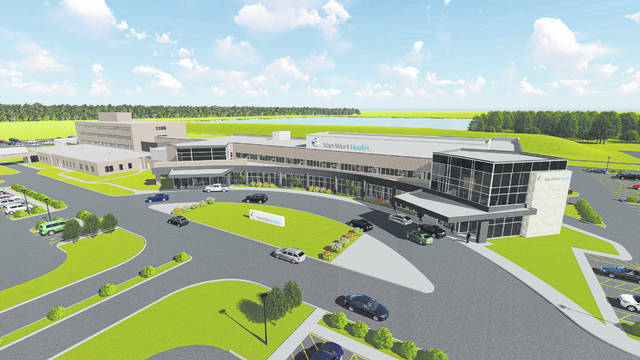 A rendering of the expansion project at Van Wert Health. VAN WERT — Van Wert Health announced plans Wednesday for a new two-story, 84,000 square-foot hospital expansion being added to the old hospital. The project will be financed by a combination of bank financing, current hospital funds and public bond financing, said Ellen Rager, Van Wert Health director of patient and community relations. The expansion, which is being designed by Design Collaborative, Inc. out of Fort Wayne, Indiana, will include an all new, state-of-the-art surgery unit increasing Van Wert Health’s ability to provide more space for surgical procedures. The new surgery unit will feature four larger surgery suites with advance surgical equipment on hand, three endoscopy rooms, a post-anesthesia care unit, a new pre-admission testing area with better access to labs and x-ray, a new private post-surgery pick-up area and 16 private rooms for pre-surgical and post-operative patients. The expansion will also provide new labor and delivery rooms, a new cesarean section suite and more OB/GYN rooms. Five new intensive care unit rooms will be included in a new dedicated critical care area in the expansion, along with a private patient registration area and private acute care rooms. There will also be expanded IT to support the new clinical data system and a new cafe. A new parking lot and lobby will be part of the expansion project additions to the hospital. Construction on the expansion is planned to begin mid-September and take approximately two years to complete. Weigand Construction out of Fort Wayne will manage the project construction. “By making such a significant investment in our community, Van Wert Health is making it clear that they are committed to providing the very best care to the people in northwest Ohio,” Van Wert Mayor Jerry Mazur said in a Van Wert Health press release. https://www.limaohio.com/wp-content/uploads/sites/54/2018/08/web1_VWH_Expansion-Project-Rendering.jpgA rendering of the expansion project at Van Wert Health.